This city comes with some truly world-class sports facilities, thanks in no small part to the legacy remaining after Sydney successfully hosted the Olympic Games in 2000. Many exceptional sporting fixtures and stadiums remain, particularly around the heavily redeveloped westerly suburb known as the Sydney Olympic Park. Boasting an overall capacity of more than 80,000 spectators, the ANZ Stadium (previously named as both the Stadium Australia and the Telstra Stadium) has played host to a number of major sporting events since being built in 1999, including the finals of the Rugby World Cup. Also within the Sydney Olympic Park is the Allphones Arena, the Athletic Centre, the Hockey Centre, the International Aquatic Centre, the NSW Tennis Centre and the State Sports Centre. 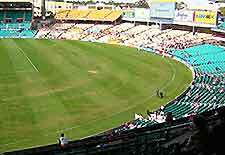 The Sydney Cricket Ground is situated in the Paddington area and is the venue for the popular Pura Cup interstate cricket matches, international test matches and World Series Cup. Of note, the Australian cricket season runs from October until March. Soccer is one of the most popular spectator sports in Australia and the city is part of a semi-professional league. Despite its popularity, Aussie soccer tends to get given very little coverage in the media. The local football season is during the autumn and winter, from March to September. Australian Rules Football is run by the Australian Football League (AFL). The Sydney Swans serve as the city's principal team, playing regular matches at the Cricket Ground, together with North Melbourne's Kangaroos team. 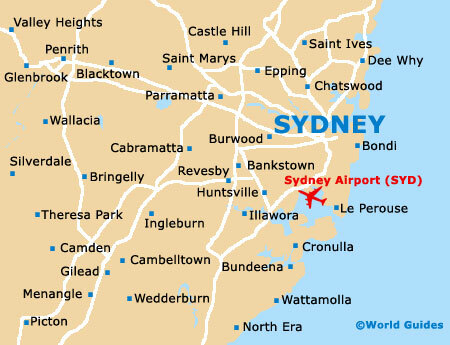 This is one of the world's capitals for playing rugby league and many games are played throughout the city, being staged at various venues. 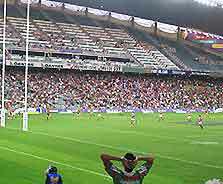 The main Rugby League competition is the Telstra Premiership, operated by the National Rugby League (NRL), with games at the vast Allphones Arena (formerly named the Superdome) within the Sydney Olympic Park, and at the Aussie Stadium in Moore Park. Rugby Union also has a strong following and the Wallabies are the main team in Australia. The 2003 Rugby World Cup was staged in Australia, with many matches played in Sydney. The highlight of the tennis year is the Adidas International Tennis Tournament, which is held within Sydney's westerly suburb of Homebush Bay during the second week of January. This popular event attracts some of the best tennis players in the world and is a prelude to the Australian Open tennis competition, which takes place each year in Melbourne. There are also numerous public tennis courts located throughout Sydney, including Miller's Point Tennis Courts at Kent Street - in the Rocks area, and Rushcutters Bay Park in the Kings Cross district. Yachting is a major pastime for both locals and visitors to Sydney and at the weekend, many hundreds of yachts sail around the picturesque harbour, many of which are extremely large and impressive. The main yachting season falls between September to March. There are a number of sailing, canoeing and kayaking schools in the area, suiting experienced and novice sailors alike. 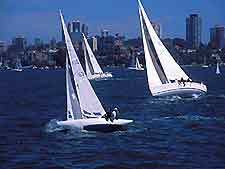 With inexpensive introductory lessons, sailing is a particularly enjoyable way to tour Sydney Harbour. Sydney is home to many superb beaches with excellent waves, making it one of the most popular locations in the world for surfing. Some of the top spots for serious surfing include the beaches between Manly and Palm Beach, such as Curl Curl Beach, Dee Why Beach, Mona Vale Beach, Newport Reef Beach, North Avalon Beach and North Narrabeen Beach. Sydney is home to some of the most impressive diving locations in the world, including spectacular coral reefs and clear waters. The best shore diving areas include Gordon's Bay Underwater Nature Trail to the north of Coogee, Shark Point in Clovelly, Shell Beach in Manly, and Ship Rock in the Cronulla area. 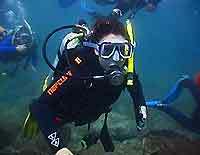 Some of the most popular dive sites include Sydney Heads, a number of areas close to the Royal National Park, and Wedding Cake Island nearby Coogee. There are numerous well-equipped fitness and sports centres in central Sydney, with excellent state-of-the-art fitness and weight training equipment, aerobic courses, personal trainers, saunas, solariums, steam rooms, hydrotherapy and massage. Most gyms are open daily, from early in the morning until late at night. Visitors, tourists and locals in Sydney all share a love of water sports and the city is home to over 100 public swimming pools. Some of these pools are set into beaches and many of the outdoor pools close at the beginning of May, opening again in October. Fishing is a particularly popular pastime for locals and many of the resident fishing boats are equipped with modern, state-of-the-art technology radar and fishing equipment. Some of the fish most frequently caught in the waters outside Sydney include yellowfin tuna, marlin, mahi-mahi and tiger shark, depending upon the time of year. There are numerous cycling trails throughout Sydney that are suitable for mountain bikes. Many of these are located on the outskirts, where they boast scenic views of the surrounding bushland and ocean. Horse racing is a popular sport in Sydney and the main racecourse is the Royal Randwick Racecourse, located in Alison Road, within the easterly suburbs. The Royal Randwick is home to many regular horse-racing events and is easy to reach by either bus or car. The city's number two course is the Warwick Farm Racecourse, which is located on the Hume Highway in the Greater West area.